Braving torrential downpours and the ominous tidings of a full moon on Friday the 13th, four Skidmore College students doing research with Mary Crone Odekon made their way from Saratoga Springs NY down to Union College. 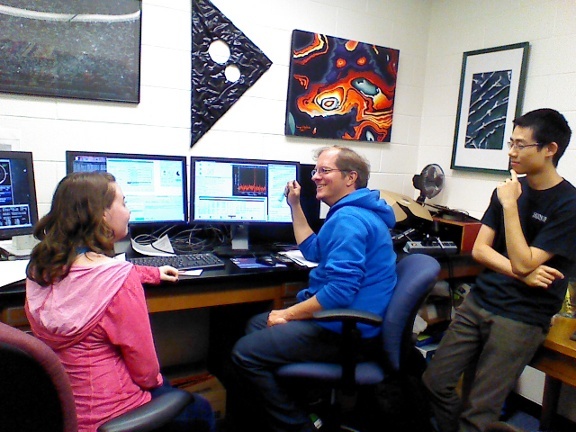 That night they had the opportunity to remotely control the Arecibo Observatory in Puerto Rico along with Parker Troischt from Hartwick and Becky Koopmann from Union. 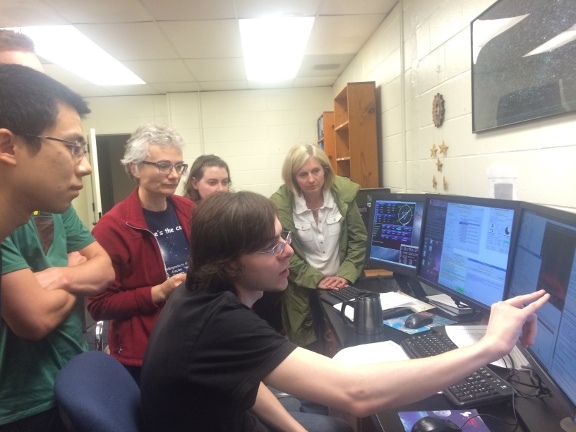 Observations are currently underway as they look for HI detections from galaxies with detected star formation. So far, this summer’s work for the Skidmore group has involved confirming previously obtained group selection results from the AGC catalog with the Sloan Survey data. Happily enough the two data sets resulted in the same group identifications and further work is now underway to improve the determination of local density for each galaxy deemed to be a member of the group. The new technique being implemented relies on an absolute magnitude selection after employing the previously implemented red shift cut on the entire survey data set. The goal is to be able to compare the local density for groups at different distances. 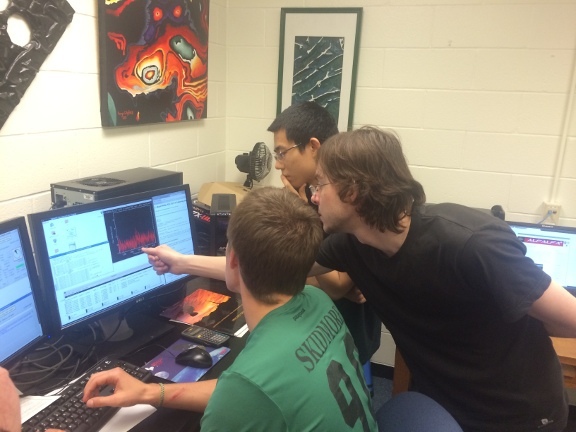 Skye, Pierre-Francois, and Yang examine a possible detection. Another aspect of their research has involved checking the uncertainties in HI mass and HI deficiency that arise from uncertainties in galaxy distances. This was accomplished using a random number generator to create iterations with distance errors with a gaussian distribution that has a standard deviation of 10% of the galaxy distance. Analysis of the original data and the randomized sets have thus far shown that the estimates of HI mass and HI deficiency statistics are robust. Finally, they are checking whether their results depend on whether galaxy groups are defined within a fixed radius or depend on the size of the groups. So far the results look similar even when groups are defined in this different way. Yang, Becky, Margot, Pierre-Francois, and Mary.